I live on the Rame Peninsula, a beautiful corner of South East Cornwall. The coast with it's amazing marine life is my greatest source of inspiration. I challenge myself by using the huge variety of media that I find in ocean plastic as a means to communicate and raise awareness about the problems caused by ocean plastic pollution. I work with Rame Peninsula Beach Care www.ramepbc.org helping to remove rubbish from our local beaches. We often find interesting pieces that can be saved and turned into unique pieces of work for public displays. My work ranges from Trawler Trash, a huge 3m x 3m mural (partly made with a group of 100 Cornish school children) to a small but incredibly detailed trophy made from cotton bud sticks, presented to Marks and Spencer at the Boat International 2016 awards at a glitzy Mayfair club. 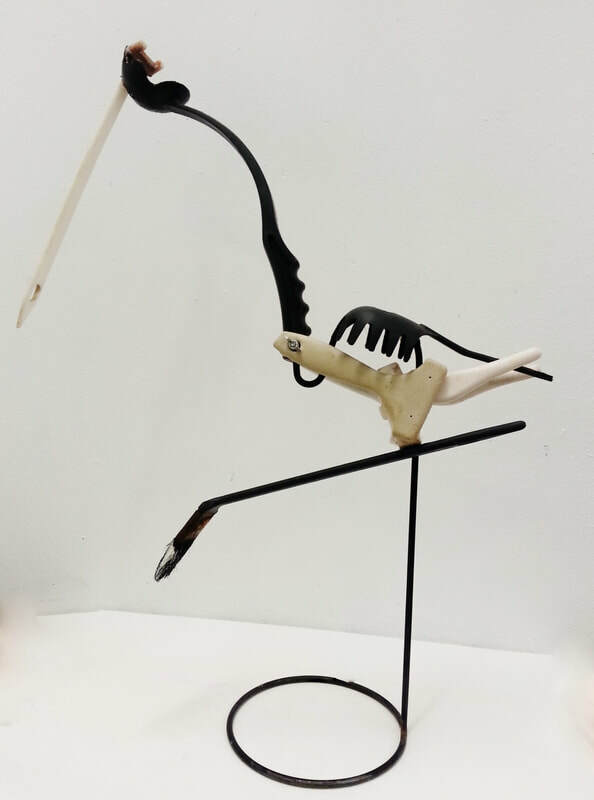 My pieces are inspired by the beautiful and natural creatures of the sea, rendered in the utterly unnatural plastic man made detritus that now threatens nearly every marine life form and habitat. From the often emotional reactions to my work over the years, it has become clear to me that ocean plastic Art is an incredibly effective medium for getting across the message about the marine plastic crisis. 'Trawler trash (2014) was commissioned by the Environment and Sustainability institute at Exeter University, Penryn in 2014. 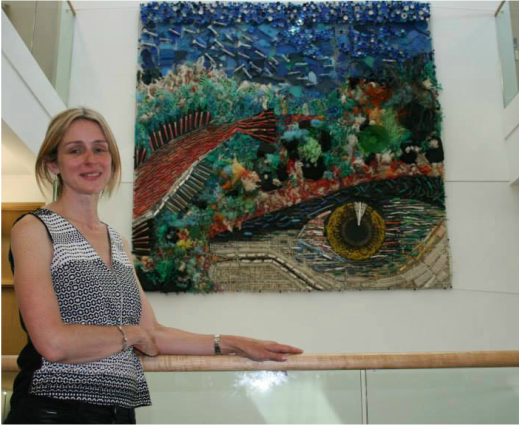 It was displayed in the atrium at the ESI and moved to the Port Eliot festival in 2017. to be viewed more widely and to highlight the ethos of the event which was to reduce plastic. 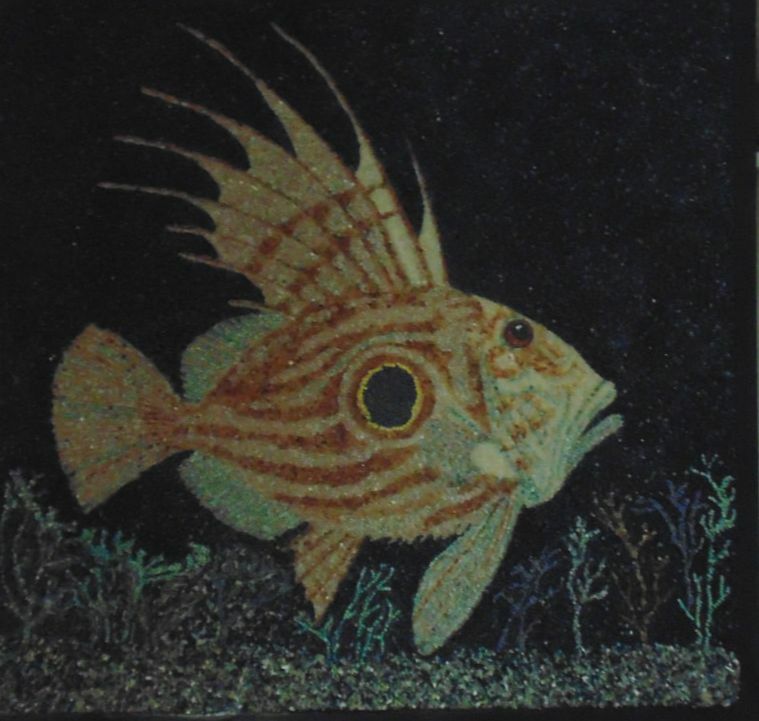 The mural presently resides at the Plymouth Aquarium where it can be seen by thousands of children each year who come to visit their Education Centre . In association with RPBC, Blue Marine Foundation. Boat International and Y.co. This trophy was made for the retailer Marks & Spencers for their responsible sourcing of fish. I made this sculpture from Polystyrene, nurdles, cotton bud sticks and other pieces of ocean plastics. Like a phoenix rising out of water this sculpture represents the resilience of nature in a world suffering from the ill effects inflicted by the human race. Wheel of fortune - I found this circle of compartments on Tregantle beach. I have no idea what it is but it has been ideal for displaying some of our more interesting beach finds. Beach cleaning has its rewards! It is called the wheel of fortune as this harmful plastic has fortunately been removed from causing harm to marine life.